Why your Enterprise should have a SAP System? Home Why your Enterprise Needs a SAP System? Why your Enterprise Needs a SAP System? Business software solutions designed to meet the specific business needs are useful to foster growth and development of your enterprise. Many small and medium businesses use integrated software and applications to get a unified view of their business. All such websites do not succeed in providing strategic business insights that lead to clear decision making. The results obtained from these distinct applications are often error-prone, manual and labourious. SAP is one of the premier business software solution providers serving enterprises across industries with better work and data management. Today, SAP is a leader in enterprise applications which is adopted by small and medium sized businesses to achieve their organisational goals. It is the best-in-class ERP system which helps companies replace an inefficient and outdated IT system and enable better accuracy in information and growth in business. Keep reading to learn why having a SAP system for your enterprise is of utmost importance. If you run a small or medium-sized organisation, having a highly convenient ERP system for managing all your business processes will enhance business growth and profit. Following are the primary reasons why you should implement SAP to your business system. SAP is an effective tool that integrates all departments of your business and provides visibility across all domains of business. It follows the best practices methodology to bring out the best from each module of business. It lets the companies work from a shared database company-wide. It replaces all the company spreadsheets with a single user accounting package and thereby eases the business management. Companies use SAP system along with their existing ERP system to maximise business profits. Companies having an effective ERP system are sure to stay ahead of those carrying out tasks manually. Implementing SAP to their business enables manufacturing companies to efficiently deliver products on the promised dates and meet customer expectations. The system lets companies consolidate purchase decisions from around the world and observe customer behaviour to cater to their demands. Earlier, companies did not have a standard interface where information from each individual department could be shared. Small and medium sized businesses started linking different systems together to bring visibility across departments and make data sharing and management easy. Implementing SAP to your business does the same. It integrates all departments of the enterprise and lets employees share data amongst each other to avoid complexity. It can help your business save a lot of money in support. Implementing SAP to your business can do benefit to your business by its dependability and can be customised to your specific business needs. Do you require assistance with implementing SAP to your enterprise? 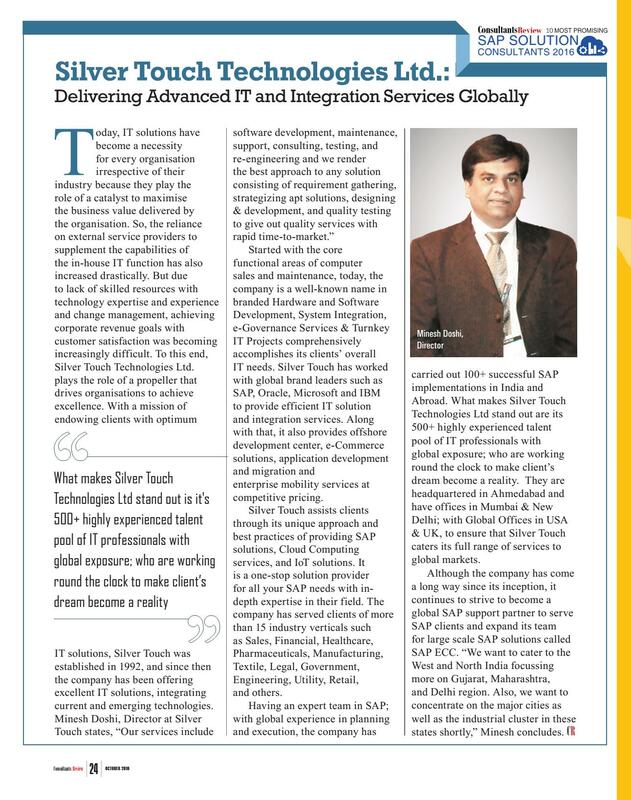 Silver Touch Technologies is a certified SAP Business One Partner having an experience of over two decades in catering to diverse industries within the software industry. We are one of the 10 Most Promising SAP Consultants 2016 according to the Consultant Review Magazine. Silver Touch has partnered with SAP, Oracle, IBM and Microsoft in serving the global clientele with experienced IT and integration solutions. Silver Touch Technologies has an expert team in SAP and global experience in planning and execution of projects. We have carried out 100+ successful SAP implementations across India and abroad. We follow a unique approach and best practice to study our clients’ requirements and assisting them with the most suitable SAP solution. Share your business queries and concerns with our efficient team, and we assure to get back to you with the most appropriate SAP solution to your requirement. Write to us at info@silvertouchtech.co.uk or contact us on +44 – (0) 203-872-5140 to get FREE SAP Demo.